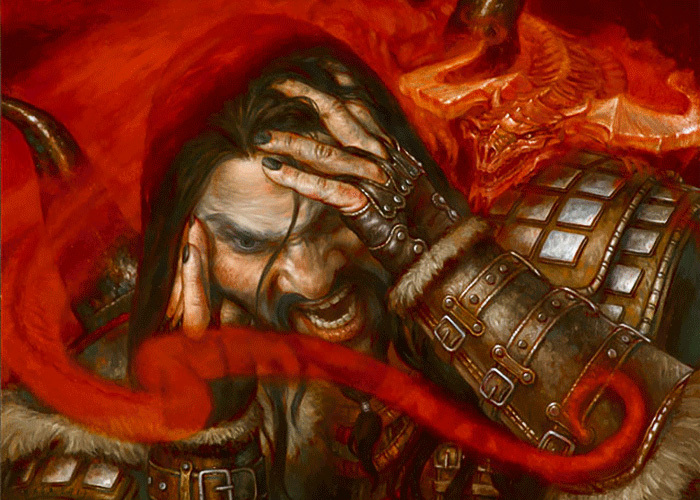 The Planeswalker Sarkhan Vol has never had it easy. Born on a windswept, war-torn world where dragons are extinct, he became a Planeswalker as a young man and set out to find and worship the greatest dragons in the Multiverse. He eventually ran afoul of the one of the oldest and most powerful dragons in existence: the ancient and malevolent elder dragon Planeswalker, Nicol Bolas. With his will broken and his mind unraveling, he became Bolas's servant. 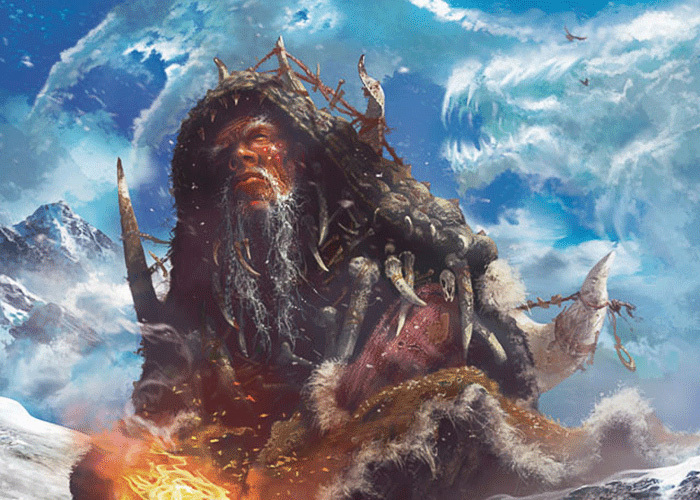 In Bolas's thrall, he traveled to Zendikar, entered the mysterious chamber called the Eye of Ugin, and unwittingly helped unleash the plane-ravaging Eldrazi. Unable to trust his own mind, fearful of Bolas's retribution, and cast out by his own people, Sarkhan Vol has returned to Tarkir. So I am home again. I look out over the ragged hills and the smoking steppes. This world roars life and screams death, a panorama of struggle and violence. It could be so strong. Yet it is so full of pain. It is damaged, just as I am. I wandered for so long. What purpose lies before me now? The Eye is empty. The worlds are empty. I return in disgrace because no other plane will have me. And yet...I hear something. Echoes of thought. What do they say? Do they call my name? 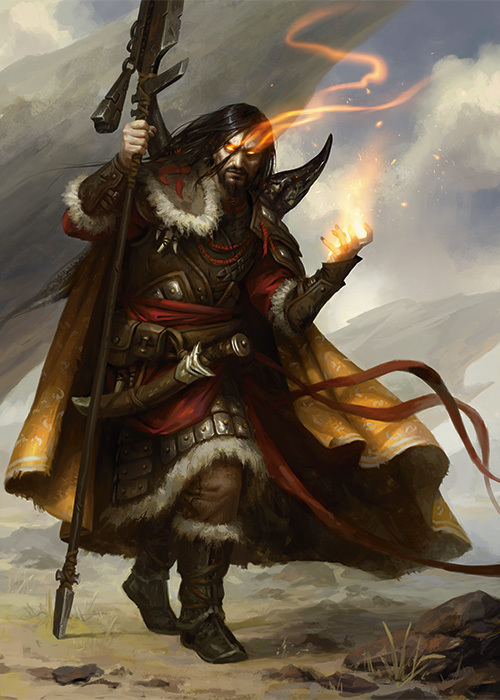 It all began with dragon's fire, Sarkhan. And dragon's fire will be witness to the end. Who are you, unwelcome voice? You have whispered in my brain for so long, but now you shout. Are you an echo from the past? A now that never was? Or perhaps I am mad, just as Bolas said. Bolas sent me to the Eye. He told me to wait. To stand watch. But when the others came, and when the...Others...left, I was left blinded. Sleeping. And when I confessed my failure, I found that I was a mere witness all along. The Eye was closed. My eyes were tricked. He left me there to watch. Watch what? Mere images on a cave wall, that writhed and spoke to me. Whispers in the dark. And when the challenge came, all I could do was fail. To fail was to succeed? I thought Bolas was the one. Old, powerful, foremost among his kind.I sought his service, and he granted it. Fool to think that I was favored in his view. A mere pawn. Now I understand: an intellect as vast as the Multiverse itself sees all the worlds as his playthings. I am dismissed, a dragon's toy, tossed aside and useless. Rags of thought over dishonored bones. Such is my reward for service. But a dragon spoke to me once. Whisper to me, King. What is the nature of sacrifice? You can heal this place. You can heal yourself. I grew up longing for the dragons. My world was—is—torn apart by constant fighting. 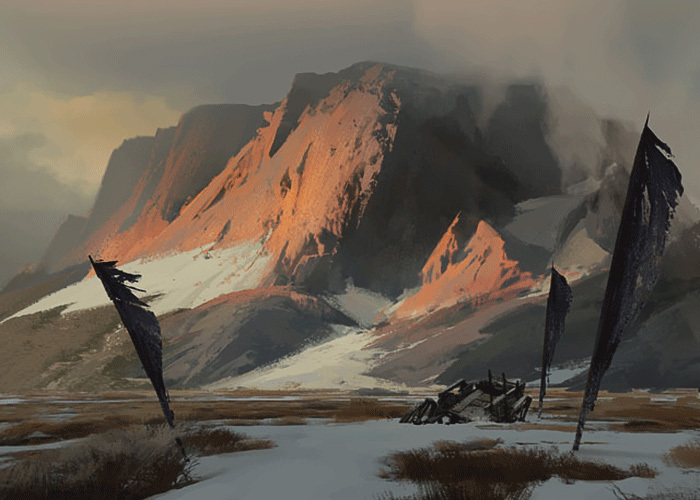 The clans clashed amid the old ones' bones, as much part of Tarkir as the bloody battlefields. We were savage, but part of me always wondered: how much more fierce had the old ones been? Like all of my people, I was born to war. Some embraced the warrior's path. They rejoiced in the furious charge and the spray of blood, hurling themselves into battle at the forefront of the Mardu. Others entered the fray out of duty. Not to fight meant cruel death at the hands of the war leaders. And there were the scavengers who tumbled about at the feet of the horses and snatched up what spoils they could in the wake of the warriors. I was none of these. The song of battle did not fill my heart. To me, warfare was just the reality of life. One wakes, one rides, one fights. That is the daily existence of the Horde. Survival depends on victory: to conquer is to eat. Still, I had a killer's way. 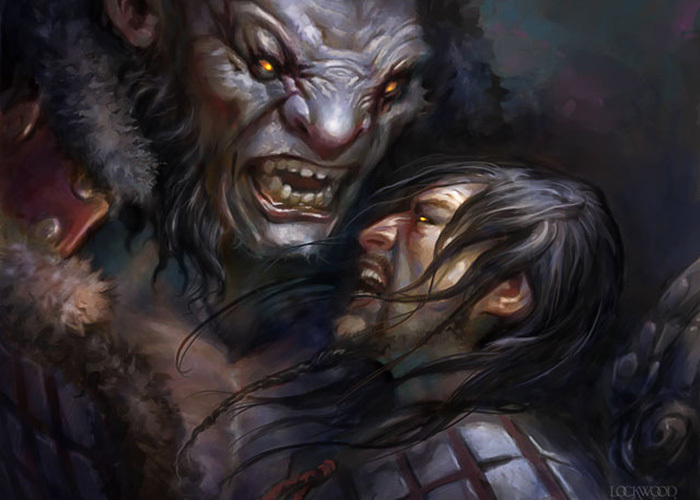 Talent with battle magic, and natural ferocity, made me feared among the Horde. I ripped gaps in the enemy lines and drove foes before my wrath. Those who fought beside me caught my fury and swept over the opposing ranks. Grandfather said my will was unmatched among our people. The hinterlands. We scorched their clans. What did we fight for, though, in the end? A scrap of land? A paltry store of foodstuffs? Such conflicts were always so petty, although so many fought and so many died. Wherever we conquered, we did not stay long. Always up and riding with the wind. I grew sick of the endless blood. Although Grandfather warned against it, I set down my spear and traveled away from the tents. Up into the Qal Sisma Mountains I traveled, seeking a call whose words I did not understand. I wandered alone through the snow, sometimes fighting the huge beasts that prowled there, but I did not know what it was I heard. You know what you seek. Do I? No, do not speak to the voice. Yet...it seems somehow familiar. Then one night, under the rainbow curtain, I found a strange thing, like a woven turtle's shell resting on a frozen river. As I approached, a figure rose from the ice and took my own shape! It whispered to me in words that echoed deep within, speaking of the dragons and their might. I reached to touch it, sealing a vow I didn't even realize I had made. The figure vanished, and I faced a youth seated on the ice, unclothed but for the shell-like headgear covering his face. He rose and draped himself in a bearskin. Then he silently gestured. I followed him into the trees. There was a cave there, where had gathered a number of others. They regarded me wordlessly from under their hoods until the youth spoke and made motions toward me. Then they all revealed their faces and began a low, murmuring chant. The voice of ages was in it. The voice of...kings. They remembered the old ones. Although the dragons flew no more, these folk heard the roaring and whispered songs of claws and blood. There was a word. A memory. A name I should know. Do I hear it now? I spent many moons there among the whisperers, but in the end I could not stay. Talk of memories, echoes of voices: these were not enough to sustain me. I had found a kind of peace, though. Maybe I could carry it with me. The whispers are no echo. Stay out of my mind, ghost! I deny you. The old ones are gone. Only the one remains. And he was false. I returned to my clan to the welcome of my warriors but not of my hordechief. Zurgo's face was dark as I approached. "You dare to return?" "I required rest and contemplation." "Are you some Jeskai sandalfoot, then, to sit and think? I require total obedience." "I am a wing leader. To command best I must be sure of myself." "To rule is to bleed. So the Edicts say. You will bleed for the Horde." The Helmsmasher grudgingly sent me forth with a wing of riders to challenge the Sultai, on the border where their stinking swamps fouled our wild lands. Perhaps those Zurgo assigned me were the dregs of the Horde. Perhaps they did not value my leadership. Whatever the reason, when we joined battle we did not sweep the snakes into the muck. The two sides scuffled like ants at war. None prevailed. At last, in frustration, I charged through the confusion and cleaved the sorcerer who led them. That should have ended it, but like a serpent with its head cut off, the enemy did not know they were dead. The pointless battle went on and on. Rage welled up in me. And with it, an inner voice that spoke of stillness. In the midst of the carnage, I found the quiet point. And there I heard a voice. I knew it was an ancient. I could hear the ages in its words. Do you hear it now, Sarkhan? The voice spoke in the tongue of dragons. And I replied. My hands burst into flame. From my soul, a being of pure fire burst into the sky. The dragon raced across the battlefield, burning everything in its path. Flesh crisped, bones cracked. None were spared: horses, riders, naga. Rage and violence incarnate were born within me. I welcomed my fiery child. And I roared! I fell through dragonfire, glorying in the destruction. The world blazed around me in an endless moment of pure joy. Such passion! I had never felt so alive. Something must have called to me from beyond my world: the scream of the predator, perhaps? Maybe I have always heard a dragon in my mind. But which dragon? I was standing in the midst of an endless desert. A red sun clawed my shoulders. The sky was purple. This was no land I had known or even imagined. As I surveyed the alien landscape, a great shadow fell over me. Overhead wheeled the huge form of a beast I had never seen except in trances and in shamans' paint. Wonder and joy filled me. Cut off from my own world, I had at last found my true kin. I spent the next years watching and following, learning all I could about the dragons. I had thought the one I saw in my first moments to be a lord of the skies. How foolish and naïve I was then! It was but a lesser breed of their kind. I soon discovered its weakness. It fell to the fire of a mightier beast. I followed the conqueror. Years passed, and I sought ever larger, older, and more cunning individuals. I tracked them. I learned their names. I marked their roosts. And I saw them all meet their end. But the death of each only spurred me to find one even more powerful, one who was fit to honor as a true king. One day I came to a fierce new world. Cinders crunched beneath my boots. The sky shuddered with storms. Tangled trees crawled down the slopes to boiling pools of tar. Red rivers clawed through the tortured rock. As I surveyed the savage landscape, I heard the screeches of countless wild beasts. The air and even the earth reverberated with the growls of carnivores and the death cries of prey. A hot wind scoured my cheeks, and I looked up. The air was filled with mighty wings and fire. Ah, he was magnificent! Even at distance, his power was evident, in the thick muscles of his neck and jaw, in the forceful stroke of his wings. He was garbed in ash, like the royal robes of a khan. Then the great predator stooped on some unseen prey. He unleashed a shriek so raw it seemed to tear the land itself. Fire burst from the peaks as the master of the sky dived to meet them. I had arrived in paradise. 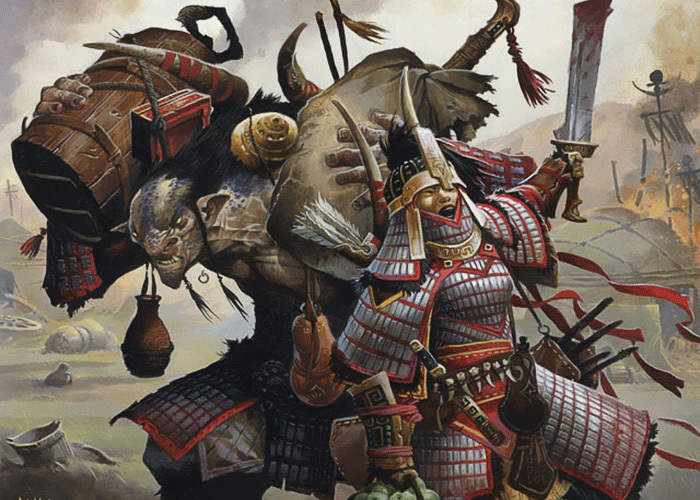 There on Jund also I found tribes of humans, braided and painted hunters who stalked the dragons and took their strength as trophies. Their ways were simple, but their spirit and their daring were unmatched by any but my own folk. An entire hunting party might be lost in the chase, only to be followed by others just as eager. They were strong, in a way so many others were not. I crossed paths with them at times, but never joined their pursuits. Except once. Old Malactoth—he had been a true challenge. The one against whom I would test myself, to offer my fealty. But even he fell. The sky tyrants of Jund were mere beasts, no matter how powerful. None there deserved my service. And I began to wonder if any dragon lived in all the worlds who could be what I sought. One who could lead me, instruct me, bring out all my potential. One did. But you did not listen. "I put him where he lies." Did not Bolas tell me this? Or maybe it is Bolas who lies. What dragon did I hear? Who do I hear now? Maybe the mountain seers were right. The world remembers what its people have forgotten. I am here now, phantom. You tell me to return. To a world that rejects me, as my master rejected me? What awaits me here? Nothing but riddles! Trickery! What doorway? This world is a battleground. Nothing stands for long. What would you have me do? 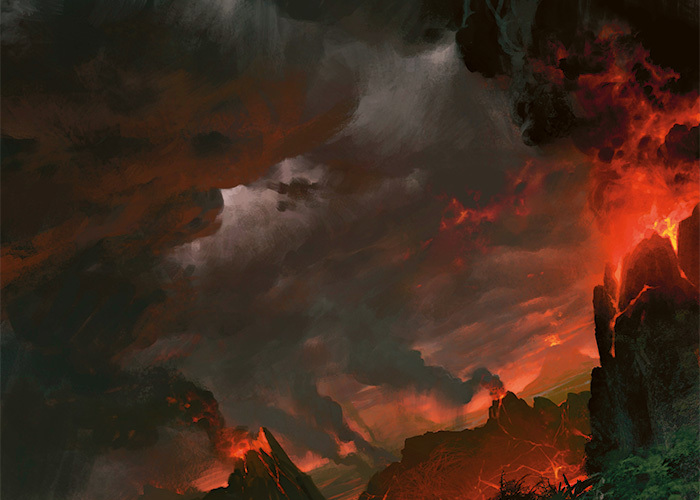 Tarkir is a place with no future and a contended present. In the long past, though...we humans had built something to endure. Our civilization had lasted for centuries despite the constant attacks of dragons. Or was it because of them? To compete together against a powerful enemy—that was what made us strong. But when the storms stopped, and the sky kings fell, that was the start of our fatal weakness. I hear the hunters' horns. I feel the arrows' wind. The dust of numberless hooves sweeps across my sight. The battle is on me, as it has always been. The answer is here, somewhere on my world, but not in this place. My travels are not yet at an end. I hear your voice. I will seek again the whisperers of the mountaintops. Maybe they hear you as well. I will find the door. I will make us strong again.